It wouldn't be a gaming convention without some new Injustice 2 announcements, and fortunately Warner Bros has rocked up right on time to reveal that Suicide Squad's Harley Quinn and Deadshot will be joining the release's roster. The former looks especially fun to play, as she uses a combination of her hammer and attack dogs to do the business. These are the eleventh characters announced for the anticipated sequel, which is really looking good, isn't it? Nice! I love me some Harley. I hope they don't use a skin for Deashot that looks like Will Smith. Well, at least Harley Quinn looks like a woman, more than I can say for the other female characters in the game. 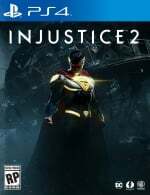 The Suicide Squad's version of The Joker, Harley Quinn and Deadshot are also gonna be available in the tablet version of the Injustice game I believe.